Just 100kms from the Mediterranean, and further south than Granada, Sierra Nevada is nonetheless an impressively snow-sure resort on the northwestern slopes of Veleta, the third highest peak in Spain. The resort itself, which is a mix of whitewashed, traditional buildings and more modern hotels and apartments, is at 2100metres and above the tree level, so some of the best places to say in Sierra Nevada are right up there amongst the snow - but the lifts go up to an impressive 3282metres. Our Guru’s recommendations for the best places to stay in Sierra Nevada all share incredible views of this beautiful national park, and are all close to the lifts. The combined skiing area of the resort comes to around 95kms, with mostly blue and red runs served by around 30 lifts and gondolas. There’s also plenty of off piste terrain to explore. The food is good and the après-ski is friendly and much busier at weekends. El Lodge has about the best location going, on the Granada side of the park, tucked under the Pico Veleta. This upscale hotel has 20 carefully designed rooms featuring old ski posters and antler chandeliers, plus all the rooms open out onto a balcony or terrace. There’s a fine dining restaurant and a chic bar. 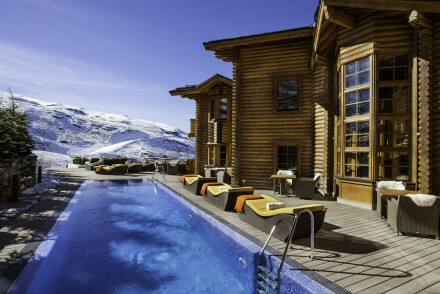 Still not sure which is the best place to stay in Sierra Nevada for you? An upscale luxury hotel in a stunning location. Plush designer rooms feature old school ski posters, animal prints, and antler chandeliers. All rooms open out to a balcony or terrace and some come with hot tubs. Enjoy the fine dining restaurant, chic bar and cosy lounge. A cool mountain retreat. Active Holiday - Skiing being the main point of interest here, you may also opt to hike or go mountain biking in the surrounding mountains. Families - The ideal playground for the whole family, from the stunning spa and bar for adults to the basement kids club. Back to Nature - Enjoy the sweeping mountain views from the rooms, the restaurant and the spa and pool area as well. Local markets - A 30 minute ride away, explore Granada, an interesting city for its history and culture.